The road leading into the park is very poor and should be driven with care, and should only be used with a 4 x 4 or ATV vehicle. Boulder Creek Provincial Park is a small parcel of old growth hemlock forest located approximately 41 km north of Smithers. Although the park has limited access, it is an access route for hikers, ATVs, and mountain bikers to the upper part of the valley, such as Brian Boru and Tiltusha Peaks. The access to the park is very poor. 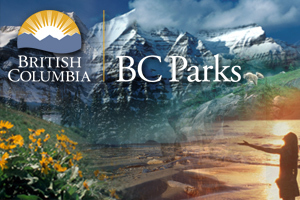 The park can be accessed via Boulder Creek Forest Service Road, 41 km north of Smithers. The road has been brushed and is passable by 4 x 4 for 3.7 km, where it becomes narrow and passable only by ATV. The park boundary lies 5.5 km from highway 16. History: Boulder Creek became a Provincial Park in the year 1999. Cultural Heritage: Within the traditional territory of the Wet’suwet’en First Nation. Conservation: The park protects a small parcel of mostly old growth hemlock and a small amount of balsam fir, spruce and pine with a rich mossy undergrowth indicative of an old growth forest. The stand age class is approximately 250+ years. The Ministry of Sustainable Resources designated the Boulder Creek Valley as a Forest Ecosystems Network to protect its natural values and provide wildlife habitat. Wildlife (specific to this park or area): Moose and coyote are known to frequent the area. Cycling is permitted. Bicycle helmets are mandatory in British Columbia. There are no developed trails at this park. Visitors should be prepared and experienced with the wilderness.